One of the best things that I have chosen to do with Abigail is swimming lessons. And what has been even more special is that Abi's daddy has been FINALLY able to come with us as see what it's all about. 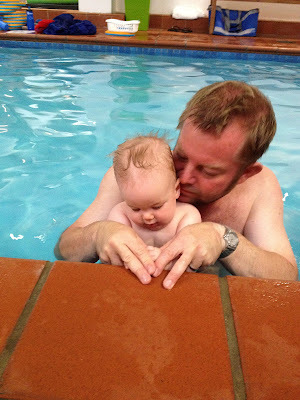 first time he came, I went in the pool with Abi, but second week around it was daddy's turn! Week 4 swimming with mummy! Just been under water! Weeks 5 - practicing 'hold on' with dad! The whole group! and our fantastic instructor Barbra! I have to say that swimming lessons is one of the best things that I have chosen to do with Abi. Did you/Do you/Will you do swimming lessons with your little one? Swimming lessons are with Aqua Babies. Naaaw way too cute, love her blowing bubbles. Swimming lessons are a must! The first photo of you and Abi in the pool is lovely and candid - you look so happy. My cookie cutters arrived yesterday too, thank you very much! Swimming lessons are the best! With my first I had to go back to work relatively early so it was nice once a week we just got to have fun in the pool together and now she is such a confident swimmer. Will be starting my second next term but it's going to be so different as my eldest pretty much swims by herself yet my second is only 5 months.... Hope I don't get mixed up and let him go! Swimming was the best activity at this age (even better than Gymbaroo and Playgroup in my opinion) because the love the feeling of the water and amazing to see how they understand cues that young too! Lily has been doing swimming lessons since she was 4 months and she hasn't missed a term yet! She still loves it and I'm going to soon get my husband to take over! What age did you start swimming lessons Sammie? Looks like she loves the water! We started swimming at 5 months. Most swim schools does let them start till they are 6 months, but a girl in my MG found one that you can start earlier. THey are AMAZING! (in their 2nd term now) and it's great to see what they know compared to A.
I'll add a link to the post. My Bubba also started swimming at 5 months. Back then, we had to take him all the way to Macquarie University from Five Dock. He's 4 now and is at the stage where he's learning the proper swimming techniques now. Time flies! The Chubster is going to start in a couple of weeks (he's 6 months now), once MrBB's business trips stop falling on a weekend.